Yasmeen Abouelhassan won top honors in the Senior/Millard Division of the oral competition. 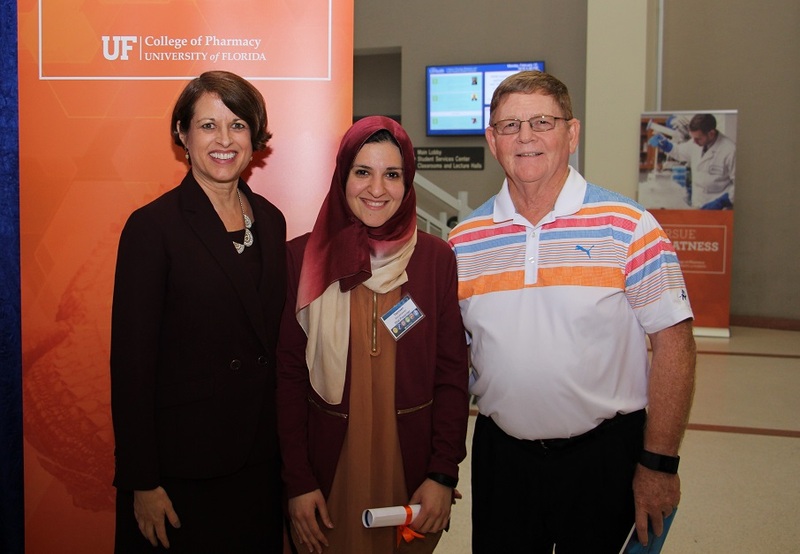 She is pictured here with Dean Julie Johnson and William Millard, emeritus faculty in the College of Pharmacy. The Annual Research Showcase entered its fourth decade of celebrating discovery, collaboration and community at the University of Florida College of Pharmacy on Feb. 12. With 85 poster presentations, eight oral competition finalists and one amazing keynote speaker, the 31st consecutive showcase continued the college’s successful tradition. Pharm.D. students, graduate students and postdoctoral fellows had the opportunity to share research findings and compete for awards in either oral or poster competitions. The showcase gave faculty and students the opportunity to come together, identify common ideas and explore collaborations. Polli specializes in the study of supporting drug metabolism and pharmacokinetics in drug discovery and development. His research emphasis focuses on drug disposition properties, particularly on central nervous system penetration, gastrointestinal drug absorption, liver disposition and drug-drug interactions. William Cary Mobley, R.Ph., Ph.D.
Sihem Bihorel, Ph.D., Pharm.D., M.S. Lance McMahon, Jr. Ph.D., M.S. Kelly K. Gurka, MPH, Ph. D.